The High Crosses that do not have much, if any, carving are often neglected by scholars because they lack interest symbolically. This lack of carving also increases the difficulty in dating these crosses. 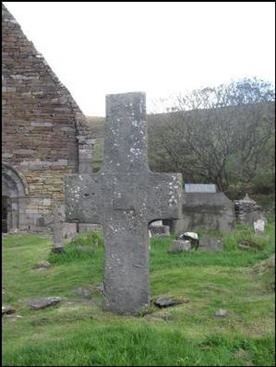 In the fall of 2011 my wife and I visited a number of largely undecorated crosses. 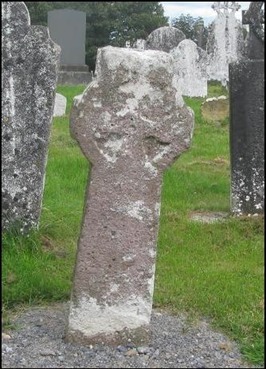 The sites are varied and each cross has a character of its own. Here are a few of these crosses. 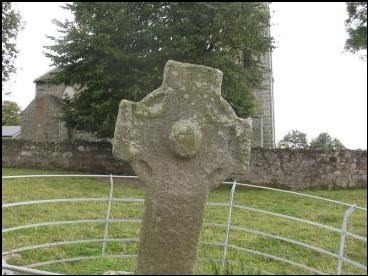 Nurney, Co. Carlow: South of the present church there is the head of a cross. It appears to have no decoration [see photo to left]. 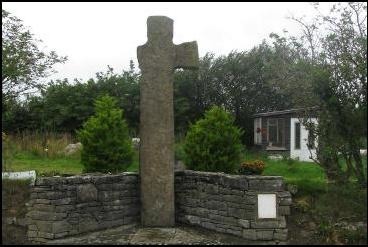 This cross does not appear in any of the lists of Irish High Crosses. The monastery here was founded by Saint Gobanus, probably in the early 7th century. It became associated with Saint Laserian or Molaise. For most of its history it was a double monastery (monks and nuns). It is said to have grown across the centuries to house as many as 1500 religious. (Old Leighlin, J M. Feeley & J. Sheehan) The setting is quite lovely and obviously well maintained. Tonaknock, Co. Kerry: The only decoration [left] seems to be small incised circles on the west head and face. 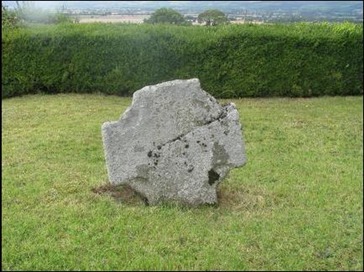 It is believed to date from the 9th century. Legend says the south arm was broken by a cannon ball during the Desmond insurrection in the 16th century. Renconnell is one of several other sites near Kilmalkedar. Others include the excavated site of Reask and the oratory of Gallarus. 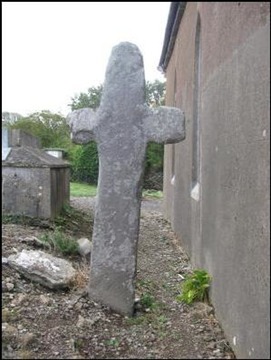 This cross is said to be in the location of an ancient cemetery. Little else is known of the history of the site. Finding Renconnell was interesting. Peter Harbison describes it as standing in the second field in from the road. The National Monument Service provided a map that got us very close. Neighbors in the area gave us the final clues. It was not, however, until I walked across the first field and entered the second that I could see the top of the cross in the distance. 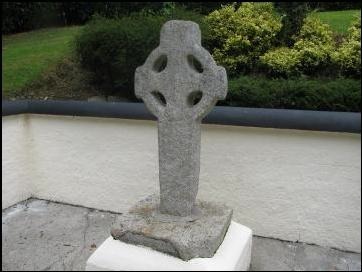 Killiney, Co. Kerry: This cross [left] stands behind the church at Killiney and very close to the south wall of the building. Sleaty, Co. Laois: North Cross: Saint Fiacc established a monastery here in the 5th century. He is said to be a contemporary of Saint Patrick and to have composed a hymn to Patrick that is probably 7th century. There is no sign of decoration on this cross. Emly, Co. Tipperary: From the Emly Parish Homepage referenced below we find this brief history of the monastery there. 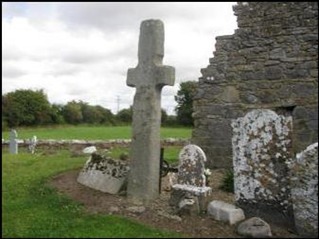 “Emly is one of the oldest centres of Christianity in Ireland. We boast that it pre-dates our National Apostle, St. Patrick. Up until the early Middle Ages Emly was the seat of the premier diocese in the south of Ireland. 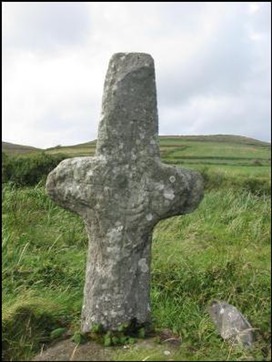 Henry S. Crawford’s “Descriptive List of the Early Irish Crosses”. The Journal of the Royal Society of Antiquaries of Ireland, Fifth Series, Vol, 37, o. 2. (June. 30, 1907) pp. 187-239.